KCCT highly values human relationships and through a well rounded campus life, the students acquire creativity, deepen their knowledge, and develop their personalities. KCCT endeavors to supply the students with substantial general education courses and promote sports and cultural club activities, so as to help the students form sound character. KCCT is located in the cosmopolitan and well-informed city of Kobe, which gives great opportunities to the students and challenges them to become technological experts who can live active lives with broad vision in an international society. 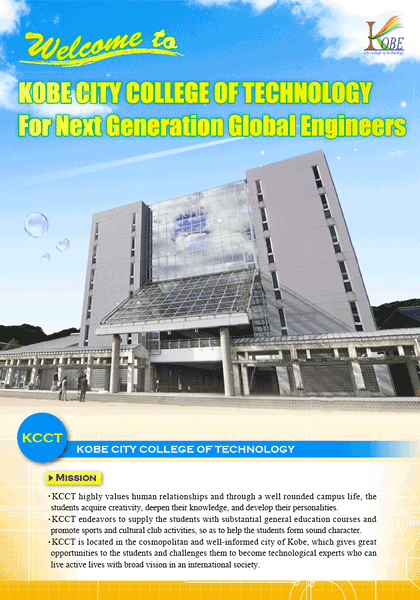 The Kobe City College of Technology was founded as a unique type of higher level education institution in 1962. The College of Technology is called “KOSEN” in Japanese. “KOSEN” provides junior high school graduates with a 5-year program of study (fundamental course), by which they can attain the same educational level as engineering college students. In 1998, advanced courses, which provide an additional 2-year program for graduates of the fundamental course, were established allowing students to earn a bachelor's degree in engineering. The school campus has a bright and open atmosphere, with a square, a courtyard, modern school buildings and other facilities with a beautiful view of the surrounding area. It has state-of-the-art equipment and facilities, including an IT Center, high tech electronic microscopes and language laboratory, a “Clean Room” and various renovated experiment and practical training rooms, which are used for education and research. take the subway Seishin-Yamate Line to Sogo undo koen station (about 20 min). From subway Sogo undo koen station: walk westward for 800 meters (13 min). From subway/bus Gakuen toshi station: walk eastward for 1 kilometer (15 min).